Louis Meyer and Alden Sampson (riding mechanic) in their 1930 Indianapolis 500 entry. 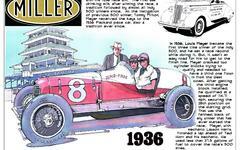 Meyer was the first driver to win the Indianapolis 500 three times, in 1928, 1933 and 1936. He was technically a rookie in his first win although he had driven relief for Wilbur Shaw the year prior in 1927. Meyer not only won the Indianapolis 500, but also the AAA national championship. However, the national championship in those days was far less sought after than in subsequent decades as the Great Depression sucked all the life out of motor sport. In fact, the 1933 season only included three races. Although he ran a light racing schedule throughout the 1930's, Meyer remained a factor until his final Indianapolis 500 in 1939. While battling for the lead in that race, he lost control in an oil slick and crashed into the guardrail. The accident was spectacular and captured on film. The clip was incorporated into racing movies, including the Mickey Rooney lightweight movie, "The Big Wheel" (YouTube). At about 1:21.00 in the movie. You'll see a spectacular shot of Meyer being ejected from his car. As the story goes, the force of the impact knocked his shoes of his feet. Barefoot, Meyer decided to retire on the spot. Take a look at the film, it's not hard to imagine a guy might take that as a message.